Such cruelty is to ensure that Palestinian hopes for a decent future will be crushed, and that the overwhelming global support for a diplomatic settlement granting basic human rights will be nullified. The Israeli political leadership has dramatically illustrated this commitment in the past few days, warning that they will "go crazy" if Palestinian rights are given even limited recognition by the U.N. This threat to "go crazy" ("nishtagea") – that is, launch a tough response – is deeply rooted, stretching back to the Labor governments of the 1950s, along with the related "Samson Complex": If crossed, we will bring down the Temple walls around us. Thirty years ago, Israeli political leaders, including some noted hawks, submitted to Prime Minister Menachem Begin a shocking report on how settlers on the West Bank regularly committed "terrorist acts" against Arabs there, with total impunity. Disgusted, the prominent military-political analyst Yoram Peri wrote that the Israeli army's task, it seemed, was not to defend the state, but "to demolish the rights of innocent people just because they are Araboushim (a harsh racial epithet) living in territories that God promised to us." Gazans have been singled out for particularly cruel punishment. Thirty years ago, in his memoir "The Third Way," Raja Shehadeh, a lawyer, described the hopeless task of trying to protect fundamental human rights within a legal system designed to ensure failure, and his personal experience as a Samid, "a steadfast one," who watched his home turned into a prison by brutal occupiers and could do nothing but somehow "endure." Punishment of Gazans became still more severe in January 2006, when they committed a major crime: They voted the "wrong way" in the first free election in the Arab world, electing Hamas. Displaying their "yearning for democracy," the U.S. and Israel, backed by the timid European Union, immediately imposed a brutal siege, along with military attacks. The U.S. turned at once to its standard operating procedure when a disobedient population elects the wrong government: Prepare a military coup to restore order. Of course, there were pretexts – there always are. The usual one, trotted out when needed, is "security": in this case, against homemade rockets from Gaza. A further goal might have been to drive them beyond the border. From the earliest days of the Zionist colonization it was argued that Arabs have no real reason to be in Palestine: They can be just as happy somewhere else, and should leave – politely "transferred," the doves suggested. The water supply is still severely limited. The U.N. Relief and Works Agency (UNRWA), which cares for refugees but not other Gazans, recently released a report warning that damage to the aquifer may soon become "irreversible," and that without quick remedial action, Gaza may cease to be a "livable place" by 2020. All this is part of the general program that Dov Weisglass, an adviser to Prime Minister Olmert, described after Palestinians failed to follow orders in the 2006 elections: "The idea," he said, "is to put the Palestinians on a diet, but not to make them die of hunger." Recently, after several years of effort, the Israeli human rights organization Gisha succeeded in obtaining a court order for the government to release its records detailing plans for the "diet." Jonathan Cook, a journalist based in Israel, summarizes them: "Health officials provided calculations of the minimum number of calories needed by Gaza's 1.5 million inhabitants to avoid malnutrition. Those figures were then translated into truckloads of food Israel was supposed to allow in each day ... an average of only 67 trucks – much less than half of the minimum requirement – entered Gaza daily. This compared to more than 400 trucks before the blockade began." The result of imposing the diet, Middle East scholar Juan Cole observes, is that "about 10 percent of Palestinian children in Gaza under age 5 have had their growth stunted by malnutrition. ... In addition, anemia is widespread, affecting over two-thirds of infants, 58.6 percent of schoolchildren, and over a third of pregnant mothers." Sourani, the human-rights advocate, observes that "what has to be kept in mind is that the occupation and the absolute closure is an ongoing attack on the human dignity of the people in Gaza in particular and all Palestinians generally. 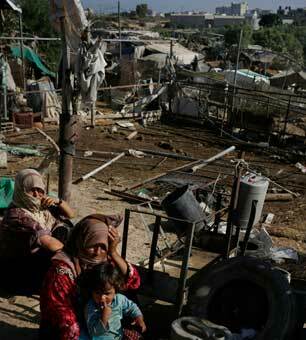 It is systematic degradation, humiliation, isolation and fragmentation of the Palestinian people." This conclusion has been confirmed by many other sources. In The Lancet, a leading medical journal, Rajaie Batniji, a visiting Stanford physician, describes Gaza as "something of a laboratory for observing an absence of dignity," a condition that has "devastating" effects on physical, mental and social well-being. "The constant surveillance from the sky, collective punishment through blockade and isolation, the intrusion into homes and communications, and restrictions on those trying to travel, or marry, or work make it difficult to live a dignified life in Gaza," Batniji writes. The Araboushim must be taught not to raise their heads. The journalist Laila el-Haddad writes that the reopening under Morsi "is simply a return to status quo of years past: Only Palestinians carrying an Israeli-approved Gaza ID card can use Rafah Crossing." This excludes a great many Palestinians, including el-Haddad's own family, where only one spouse has a card. Furthermore, she continues, "the crossing does not lead to the West Bank, nor does it allow for the passage of goods, which are restricted to the Israeli-controlled crossings and subject to prohibitions on construction materials and export." The restricted Rafah Crossing doesn't change the fact that "Gaza remains under tight maritime and aerial siege, and continues to be closed off to the Palestinians' cultural, economic and academic capitals in the rest of the (Israeli-occupied territories), in violation of U.S.-Israeli obligations under the Oslo Accords." One young woman reports on her late father's illness. Though he would have been proud that she was the first woman in the refugee camp to gain an advanced degree, she says, he ''passed away after six months of fighting cancer, aged 60 years. ''Israeli occupation denied him a permit to go to Israeli hospitals for treatment. I had to suspend my study, work and life and go to sit next to his bed. We all sat, including my brother the physician and my sister the pharmacist, all powerless and hopeless, watching his suffering. He died during the inhumane blockade of Gaza in summer 2006 with very little access to health service. "I think feeling powerless and hopeless is the most killing feeling that a human can ever have. It kills the spirit and breaks the heart. You can fight occupation but you cannot fight your feeling of being powerless. You can't even ever dissolve that feeling."